KANSAS CITY, KAN. – Homeowners Carol and Ray Knoff knew exactly what they wanted when they decided to replace the roof on their 111-year-old Queen Anne style home. They had previously found a 300-year-old roof tile from a historic home in Des Moines, and they wanted to replicate the red to gray roof coloring. Plus, the color needed to perfectly match their home’s brick patio. During a renovation in the 1990s the previous owners of the Knoff home installed black asphalt shingles on the roof, which didn’t complement the home’s style. 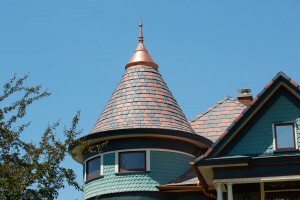 Recent storm damage prompted the homeowners to take the leap to re-roof the house and investigate custom color options. “The product testing and manufacturing processes were very impressive at DaVinci,” says Knoff. “Their customer service was also outstanding and we developed a great confidence in the team there.